Former pediatric neurosurgeon Ben Carson has a CV that most people could only dream of: Yale grad, M.D., director of pediatric neurosurgery at Johns Hopkins, and dozens of national and international medical certifications and awards to his name. In 1987, Carson became the first neurosurgeon to successfully separate conjoined twins at the head, and in 2008, President George W. Bush awarded him the Presidential Medal of Freedom for his achievements. The outspoken Fox News commentator has more than enough accomplishments to keep him at the top of most pundits' talking points for years to come — but with his recent 2016 political ambitions made clear, Carson's foreign policy stance has led many to question whether the former surgeon should be allowed to add "World Leader" to his list. The GOP candidate has had his share of run-ins with media hosts and inquiring reporters looking to pick apart his qualifications. It's not unsurprising for a political hopeful to be put through the ringer of course, but with Carson's recent 2016 White House announcement, those clamors have become even louder. In March, Salon's Luke Brinker accused Carson of demonstrating "an understanding of foreign policy that makes one pine for the sage cosmopolitanism of Sarah Palin." And he wasn't completely wrong: Carson's infamous and very public missteps have given rise to a slew of concerns over his 2016 bid and have prompted inquiries as to his readiness, given the very serious responsibility of a modern-day commander-in-chief. I think they would be willing to go to war if they knew that they were backed up by us. I think part of the problem throughout the world right now is that our allies cannot be 100% certain that we’re behind them. Hewitt pressed, "And so should we have that sort of commitment, that if Putin makes a move on the Baltic states, we’d go to war?" Carson replied that the focus should be on getting the Baltic states involved with NATO itself. "We need to convince them to get involved in NATO and strengthen NATO," he explained. Unfortunately for Carson, Latvia, Estonia, and Lithuania are already a part of NATO. After Hewitt followed up, Carson seemed to stumble, explaining that he had thought Hewitt was referring to the former components of the Soviet Union. In previous media appearances, Carson has seemingly displayed a serious misunderstanding of Middle Eastern politics as well. 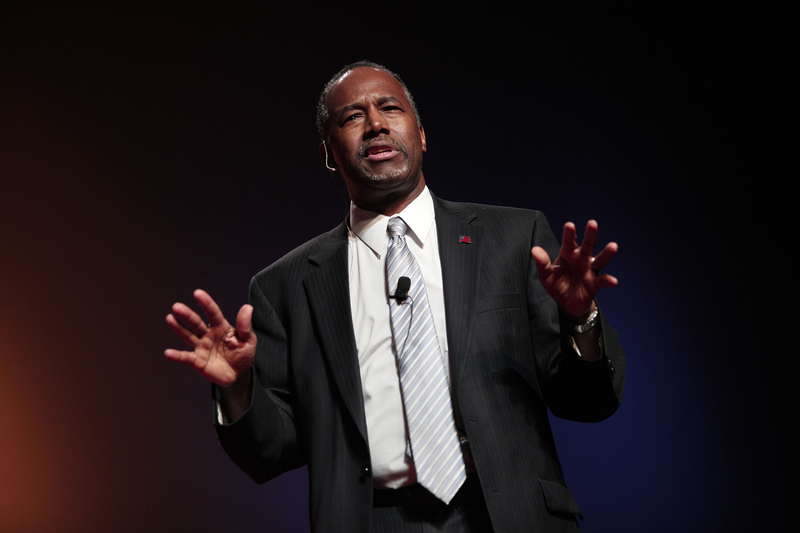 During his February address at CPAC, Carson pushed for more pro-Israel sympathy. "Let's not turn our back on Israel," said Carson. "Let's listen to Netanyahu and what he has to say." It's a pleasing enough sentiment — pleading for increased dialogue in foreign diplomacy isn't exactly a war cry. But only a few months earlier, Carson showed his naiveté in handling relations in the West Bank during an interview with the Associated Press in which he suggested that neighboring Egypt should "provide the space for a future Palestine" rather than Israel — a solution that even Netanyahu would likely consider outlandish. Carson has also touted hawkish U.S. support as a strong deterrence against Middle Eastern violence, telling reporters, "If [Israel's] neighbors know that we're backing them up, they're not going to be anywhere near as aggressive." Perhaps the crowning moment in Carson's extensive list of foreign policy slip-ups came in December last year, as Carson traveled to Israel for the first time. GQ reported that, as the now-presidential hopeful sat in the first-class lounge with his young Israeli guide, he asked her what the country's equivalent was to the U.S. political system. "In the United States, we have Republicans, Democrats, and Independents," said Carson. "What do you have?" As the young woman explained the intricate balance between Labor and Likud members and the various parties which operate within the Knesset (which the guide was also forced to explain), Carson replied, "It sounds complex — why don't they just adopt the system that we have?"